Crickets and cicadas drown out the other noises of the night, you can sit well into the early morning at an outdoor table at your favourite bar, and only tourists break the high noon silence in otherwise deserted Marche towns as the sun beats down. So benvenuto to the summer edition of the Marche Voyager newsletter. The Marche is fast becoming known for the production of some the world's finest olive oils, "monovarietal" oils pressed from single, named varieties of olive to produce olio extravergine of striking character. There are now around a dozen of these monovarietals ranging from oil made from Raggia olives, with a distinctive green almond note and produced in Ancona province, to the spicy and bitter notes of oil made from Coroncina olives from Macerata province. While the best-known white wine of the Marche is the Verdicchio dei Castelli di Jesi, the lesser-known Verdicchio di Matelica often has a more decisive character. The higher limestone hills of the upper valley of the Esino river around the town of Matelica help to produce a wine with a distinct edge over its more celebrated neighbour. Noted producers include Belisario, La Monacesca (their well-aged “Mirum” riserva is a personal favourite) and Collestefano. 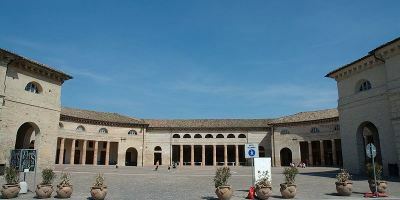 This month's image of one of the region's piazze, or town squares, features the Foro Annonario, an arcaded, circular market place built in 1834 in the heart of the seaside town of Senigallia. This summer sees the return of the weekly tours to Villa Imperiale, a splendid Renaissance villa and gardens in the hills above Pesaro. Until 26 September guided tours have been organized, including a bus ride from the centre of Pesaro, on Wednesday afternoons. The villa was originally built in 1469 for Alessandro Sforza but the most impressive parts of the complex date from 1528 when Eleanora Gonzaga ordered major rebuilding works for her husband Francesco Maria I Della Rovere, Duke of Urbino. The region can once again boast one of the highest number of Blue Flag beaches of any region in Italy, only just beaten once more by Liguria. The Blue Flag is awarded by the Foundation for Environmental Education across Europe to environmentally well-kept beaches. The prestigious "eco-label" is given to sites that meet strict criteria including water quality, environmental management, safety and other services. The region's sixteen towns entitled to fly Blue Flags for 2012 are, from north to south, Gabicce Mare, Pesaro, Fano, Marotta, Senigallia, Portonovo, Sirolo, Numana, Porto Recanati, Potenza Picena, Civitanova Marche, Porto Sant'Elpidio, Porto San Giorgio, Cupra Marittima, Grottammare, and San Benedetto del Tronto. Escape the summer heat with a visit to the Grotte di Frasassi, one of Italy's largest and most famous warren of caves, where the temperature is a constant 14° C. The largest cavern, the Grotta Grande del Vento, is large enough to enclose the whole of Milan Cathedral and claustrophobics need have no fear of tight spaces in these caves. The regular tours take 1 hour 15 minutes, and adult entry costs Euro 15.50. While you're there take time to wander up to the nearby small but pretty hilltop village of Genga. Photos & panoramas on the Frasassi Caves website. If you're coming to the Marche this summer, don't forget to buy a copy of our excellent - well, we would say that wouldn't we - guide to the region. Le Marche: an insider's guide by Peter Greene is available both as a paperback and as an ebook. Marche Voyager buy the book page. The Marche shares a short stretch of its borders with a foreign country - the pocket handkerchief Republic of San Marino to the north of the region.